Public program sponsored by the Whitewater Memorial Library's Friends of the Library on January 19, 1994. Henry Scrivner and Eldredge Davis were the featured speakers. Reproduced by the copyright owner. Further reproduction prohibited without permission. 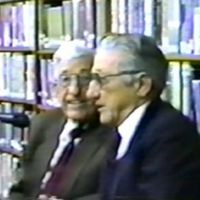 Whitewater Memorial Library, Whitewater, Kansas, “As I Remember - Henry Scrivner and Eldredge Davis,” Digital Whitewater, accessed April 19, 2019, https://whitewater.digitalsckls.info/item/11.